A myriad of equipment, from motors powering conveyor belts and lighting systems to Industrial transformers, are prone to these types of challenges at work sites. Focusing on the latter, the National Electric Code (NEC) has set forth requirements surrounding proper spacing around power transformers in Article 450. The NEC guidelines are designed to promote adequate airflow and heat dissipation, while boosting operational efficiency rates. Proper spacing should be observed during installation of transformers to streamline cooling around the unit and the surrounding environment. Cool operating temperatures allow transformers to take on large loads without overheating or generating errors. In this case, heat is considered to be waste and must be released or ‘pushed out’ to prevent temperature rises inside transformers. Moreover, increased exposure to high temperatures can decrease the expected lifespan of transformers. This is due to degradation of insulation components inside the unit. Spacing around transformers is an effective way to optimize airflow. Air from fans, cooling systems and blowers need space to pass or move through hot-running equipment. When machines, stations and large devices are grouped tightly together, heat will accumulate around the area due to lack of space and dissipation. Next, in maximizing building layouts, some planners are prone to implementing aggressive floor spacing practices that group heavy-duty equipment too close together in order to save on operating or building rental costs and improve payback projections of the space. With this in mind, Article 450 can be applied to make sure spacing around transformers is fully observed. The scope of NEC Article 450 includes all types of transformers, except the following (450.1): current transformers, dry-type units with components that adhere to other requirements, transformers part of X-ray or high-frequency devices, transformers used with Class 2/Class 3 circuits in compliance with Article 725, units utilized for signs and outline lights in compliance with Article 600, transformers used to electrically discharge lights in compliance with Article 410, units applied to power-limited fire alarm circuits in compliance with Article 760 (Part III) and transformers used for research or testing. Interestingly, the coverage of the guideline extends to transformers installed in classified hazardous locations and its modifications found in Article 501-504. Less-flammable liquid-insulated, non-flammable fluid-insulated, Askarel-insulated and oil insulated transformers are also considered in Article 450. According to Article 450.9, power transformers with ventilation must be installed in a manner that does not block the opening. Examples of obstructions include walls, other machines and large structures. During installation, operators may refer to the nameplate of the unit, as manufacturers are required to specify clearances on transformers with ventilated openings (Article 450.11). Other specifications on the nameplate, such as temperature class and insulation, can also be used to determine spacing requirements for transformers. A major highlight in Article 450 is nonlinear transformer loads, which can cause current distortions and interruptions. The NEC suggests that nonlinear loads are associated with increased heat. Recommendations by the NEC to mitigate unwanted heat from nonlinear loads include: derating, oversizing, boosting insulation and applying thermal protection. Another reason the NEC published spacing recommendations for industrial transformers is reliable accessibility. Article 450.13 suggests that transformers and transformer vaults should be accessible by technicians, inspectors, maintenance crews and other qualified individuals. Transformers in out-of-reach or tight locations are more difficult to maintain and remove or replace. Dry-type units rated at 1,000V (nominal or less) that are installed in open locations and on walls or structures do not have to be accessible. Additionally, low-voltage dry-type transformers should adhere to a minimum clearance of 6 inches from the wall. Article 450 provides special considerations for dry-type transformers installed in indoor locations. For units rated below 112.5 KVA, 12 inches of minimum spacing from flammable materials must be implemented. Additionally, the separation may consist of a fire-resistant/heat-insulated barrier. Dry-type transformers rated over 112.5 KVA are required to be installed in transformer rooms with fire-resistant construction. 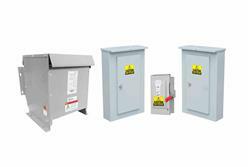 In outdoor sites, such transformers cannot be installed within 12 inches of explosive substances. Completely enclosed units with Class 155 insulation (or higher) are exempted from this practice (Article 450.22). Lastly, for oil-insulated transformers installed in outdoor locations, adequate spacing is considered to be a safeguard against exposure to flammable materials (if present in the area). The provision that governs this practice does not specify the exact distance to implement, which must be determined based on the ‘degree of hazard involved’ (Article 450.27).